It can be the similarities between two people that draw them together, but it's the differences between them that create something special. It would be nothing if those two polar opposites failed to meet in the middle. Such is the story of Pan-Pot. Tassilo and Thomas met at Berlin’s renowned School of Audio Engineering, better known as the SAE Institute, and were drawn together as they were the only two in their studies who had their sights set on the sound of techno. Their initial musical efforts placed primacy on integrating electronic experimentation with minimal stylings while simultaneously establishing the ominous, murky sounds that have since become synonymous with their name. The defining moment of Pan-Pot's career came in 2007 with the release of their debut artist album, Pan-O-Rama. The aptly named long player offered a 360-degree view of techno that was unique, uncompromised and most importantly, their own. The body of work perfectly balanced heavy, peak time club Stormers to deeper, more intricate atmospherics and birthed the overground hit "Charly". More recently "Confronted" and "Captain My Captain" have demonstrated their classic, bold and timeless production style, presenting them as the producers at the top of their game, both sonically and conceptually. Pan-Pot haven’t gotten to where they are on their previous accolades alone, the duo have lent their craft recently in the form of a second album „The Other“ and high profile remixes for the likes of the legendary Carl Cox, Slam, Paul Kalkbrenner, and the renowned Stephan Bodzin, all while touting a ferocious touring schedule appearing regularly at the best clubs and largest festivals in the world like Time Warp, Awakenings, Glastonbury, Kappa Future and Tomorrowland to name a few. The relentless touring is how they have truly gotten to where they are: by touching the writhing, euphoric, dancing seas of bodies at countless gigs every year. Not only do they have an electric vibe to watch, but their grasp and a keen understanding of each and every dance floor is unparalleled. Whether it's an intimate club night or a massive festival, Pan-Pot knows exactly what to do. Unconstrained by boundaries, they traverse Techno, House and everything in between with a masters touch. 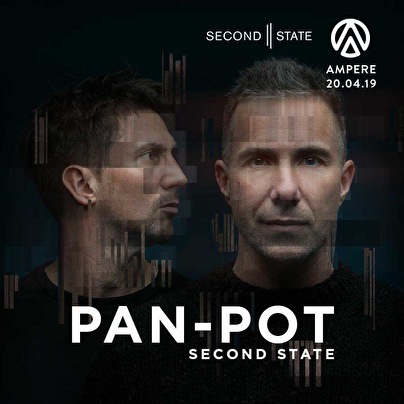 Although their name comes from a basic element of studio equipment, they have rewritten notions of form and function through their own idiosyncratic language and are now stepping completely into a new world since the launch of their own imprint, Second State in 2014. Over the last years, Second State has not only become a platform for Pan-Pot to release their own music, but a creative outlet derived from a family of like-minded artists around them to inspire, imagine and travel the world with, spreading the Second State vision and catapulting new names into the spotlight like Amelie Lens, Stephan Hinz and Micheal Klein. It’s a place where all ideas can flow seamlessly, from music and events to art and fashion. Producer, remixer, DJ & label owner, multifaceted artist Igor Vicente is turning into a truly global electronic music proposition. Vicente’s unique sound is built up over 4 or 5 hours creating a smooth & unpredictable blend of House & Techno, full of effects often creating surprise in his sets. as it is loving. Passionated and hard working, Milo recently joined the Lenske family with a very promising debut EP “Infinite".